Dark chocolate mostly. I used to love any kind of caramel chocolate, and milk chocolate, but not anymore. I can't stomach the thought of white chocolate. I don't really eat chocolate by itself though, its got to be some kind of chocolate food - brownies, cake, oatmeal. Mostly brownies though. Other than chocolate, I can pretty much pinpoint the very few foods I eat every week. Potato, bread, pasta, yoghurt, oats, honey, bananas, strawberries and spinach. I know, there are a lot of carbs in that list. I used to have the most amazing ability to eat carbs. I would eat three pieces of toast with nutella for breakfast, followed by two in the afternoon after school and probably two more after dinner. I ate pasta at least twice a week and only ever ate fruit or veggies as a necessity. Potato was pretty much the only vegetable I ate. It's so weird to think I used to be able to eat whatever the hell I wanted, whenever I wanted. Over the next week I have three chocolate recipes I plan to share with you all. I was obviously craving it a few weeks ago when these recipes were developed. 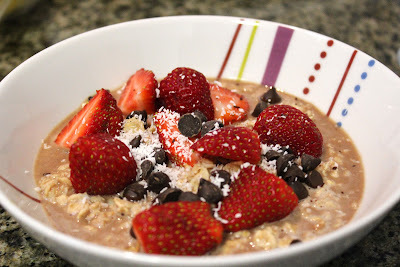 The first of these, today's chocolate oatmeal, is simple, easy to make and does not even require a stove. You can use a microwave and have this delicious, slightly wicked, breakfast ready in an instant. And the beauty of oats is that you can add any further ingredients you crave. Level of Difficulty: Microwavable easy. Menu Options: This is one of those completely interchangeable recipes. You can serve the oats with any fruit you like – banana would be lovely with this. 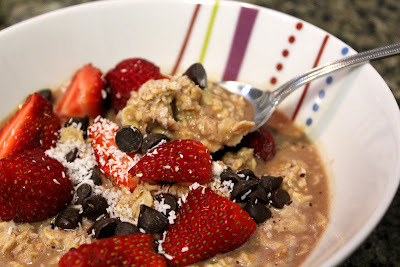 You can serve it with or without the chocolate chips and coconut – though I love the slight tang from the coconut and the chocolate chips melt delightfully in the hot oats. Can also serve with nuts, dried fruit or granola. In a microwavable bowl, combine the first four ingredients, stirring well to ensure the cocoa powder covers the entire bowl of oats. Microwave the oats for 1 minute. Stir well, to ensure the liquid covers the oats. Microwave for a further 30 seconds. Serve warm. If you like, serve with strawberries without their tops, a handful of chocolate chips and desiccated coconut. 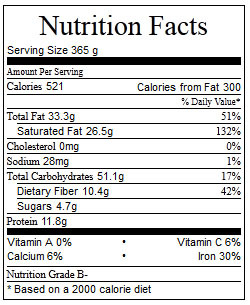 Note that these oats are not very mushy, for lack of a better word. I like my oats to be slightly hard still, so microwave the oats for longer if you prefer ‘mushier’ oats. Mmm oatmeal with strawberries is wonderful! I love microwave oats- so simple! I love oatmeal with strawberries or bananas. The best combination! I haven't had chocolate oatmeal for so long, yours looks amazing! And chocolate oatmeal is the bomb dot com! Haha chocolate is the best. 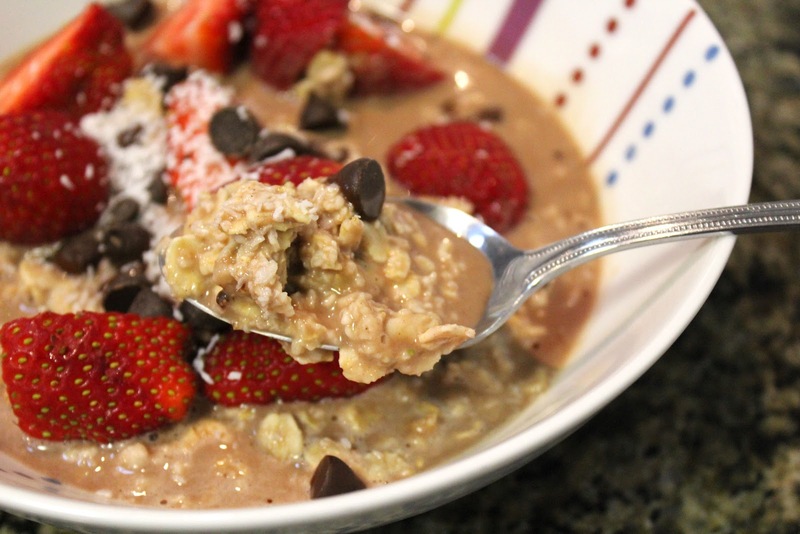 And chocolate oatmeal is one of the best breakfasts. Ever.